Protecting yourself and your family is definitely an important thing in your life. You want to make sure that they are safe from intruders, but you also want to make sure that your guns are safely stored away as well. That’s why biometric guns safes are a great way to go. They keep your family safer if someone comes in, but they also keep them safer when there’s no danger from outside forces. With these biometric gun safe reviews, you’re also going to know just what you’re looking for when you pick one out. Fingerprint Capacity: How many fingerprints can the gun safe hold? This is going to impact how many people are able to open the safe. If you want to be the only one that’s easy, but if you want a partner to open it too that’s important. Dimensions: What size is the safe itself? You want to make sure that it can hold the guns that you’re trying to store but you also want to make sure that it’s small enough to fit into the space that you actually have for it. Gun Capacity: How many guns is it able to hold? Each gun safe is designed to safely hold a specific number of specific types of weapons. You don’t want to overload it because it could be dangerous or your guns may not be protected. Batteries: What type of batteries are required to keep the safe going? Does it use a standard type of battery or lithium-ion? Is it using rechargeable batteries? You definitely don’t want the battery to die on you so keeping track is important. Mountable: Can you mount the safe onto a wall, making it more secure and safer? Are you going to have the ability to attach it in certain ways or can it only be set into a space or hidden under a bed? You want to know what you’re getting. Warranty: What type of warranty are you going to have? A longer warranty means that the company is standing behind the product that they’ve made and that is definitely going to be an important aspect when it comes to safety. With so many different gun safes out there it can be difficult to figure out just which one is the best option for you. With our best biometric gun safe reviews, however, we hope you’ll be better prepared to make a good choice. Each of our top ten is going to be a high-quality gun safe that will help you keep your family safer, no matter what might be going on around you. Available in 4 different colors so you can get your ideal look, this is definitely the best biometric safe we have found. It has plenty of safety features including anti-pry bar, dual anti-impact latches and interior mounted hinges. That means it’s ready for just about anything. Plus it has impact detection. You’ll be able to store up to 20 fingerprints so you can get anyone in who needs to but keep out those you want you as well. There’s even mounting capabilities so you can make it even more secure when you find the right place to store it. Capable of holding 2 guns, it has a 5 point entry with a smart key that offers rapid-fire backlit keypad and a Bluetooth app. You can store just about anything in here and all you need are some lithium-ion rechargeable batteries to go along with it. With a 3-year warranty, you’re getting just what you need here. If you’re looking for a simple but secure under bed gun safe biometric option then this is a great way to go. You can program in up to 4 fingerprints to make sure you and your family can easily get in as needed, but no one else is going to. You’ll be able to get into the safe quickly with the instant and quiet door and the case itself is made of solid steel and resistant to pry bars. There’s even a manual keypad and override key to make sure you can get in even if the batteries aren’t working. You’ll get a 1-year warranty here and you can feel safe storing just about anything inside. There’s no reason to sacrifice when it comes to the security of the people in your household. You won’t be able to mount this one, but it slides into just about any space you may have because of the small size. 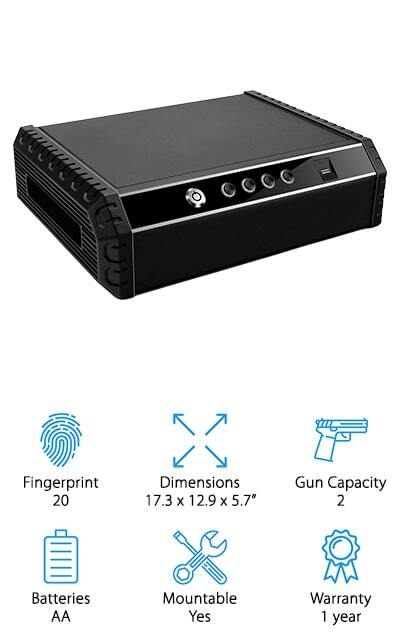 This top rated biometric gun safe is actually great for mounting directly to the wall and makes sure that you can get access to your gun faster than you might think. 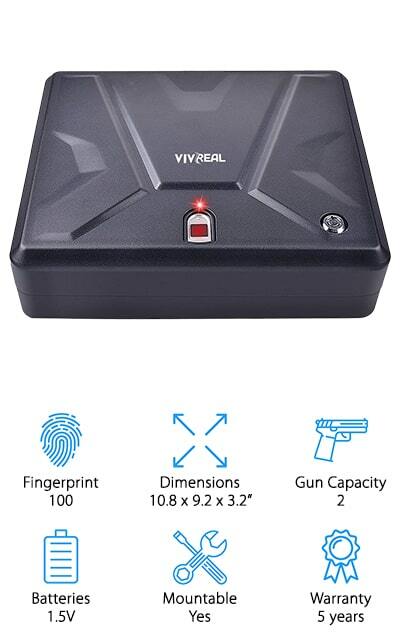 It stores up to 20 fingerprints and actually mounts so that you scan your fingerprint and your gun drops down for easy reach. It takes 9V batteries and it’s made with steel and a foam lined interior to keep your gun protected at the same time. Not only that but it’s nearly impossible to pry and the small size makes it easy to put wherever you might want. Discreet and ready to go, it’s a great option for home or business use. 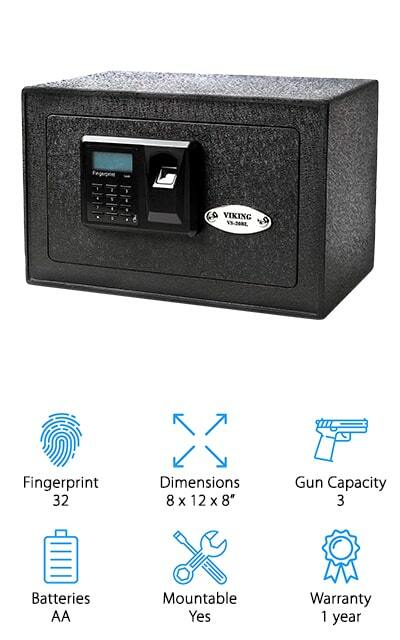 You get a 17-year warranty included with this safe and though it only holds 1 gun it’s definitely going to be enough to keep yourself and your family better protected, especially because it’s so easy to put in an out of the way place. You’ll definitely be able to get into this one no matter what. Here you’ve got a gun safe that’s really going to keep you safer. It’s not quite the biometric fireproof gun safe that some offer, but it does have plenty of anti-theft protection to offer. It can resist pry bars and it has interior security brackets and mounted hinges. On top of that, there are two point anti-impact latches that really keep it from breaking open, no matter what you throw at it. It’s made with carbon steel and powder coat finish that keeps it durable and makes sure that it doesn’t corrode over time. Plus it has rapid fire backlit keypad and the biometric scanner. 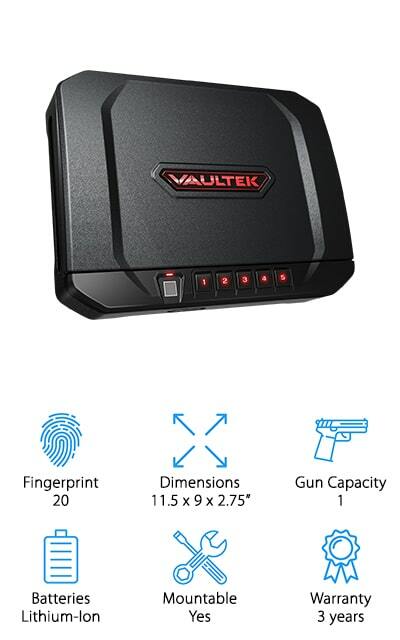 This mountable unit can hold a single gun and also holds up to 20 different fingerprints to make sure everyone you want to get in is able to do so. It’s also got a 3-year warranty and needs only lithium-ion batteries to make sure that it’s ready to go whenever you are. 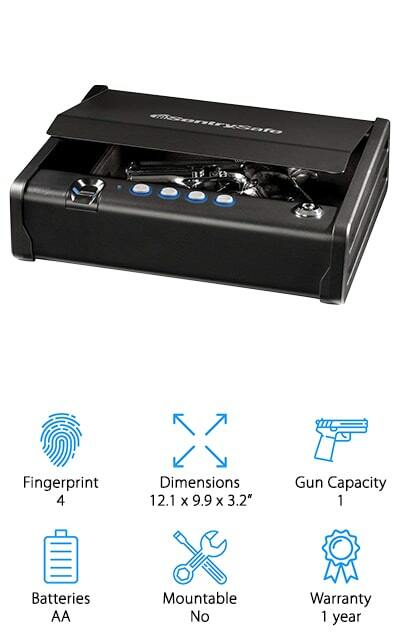 Here you’re going to have possibly the best biometric bedside gun safe. It’s moderate in size, which means that it can easily hold 3 guns but it can also easily hide away wherever you want. Completely mountable and able to hold up to 32 fingerprints, this is definitely a safe that you’re going to want to have around. You can even unlock it with a pin code if you prefer or make sure that even if something happens with the biometric features you’ll still be able to get into the safe and defend yourself or the rest of your family. With this gun safe, you’re getting a full year warranty and you’re getting everything you need to store your most prized possessions. That’s because this safe also has space for other items of importance and has a shelf to keep them organized. Made with solid steel and steel locking bars, this safe is completely silent and even lets you know if it’s been left unlocked. 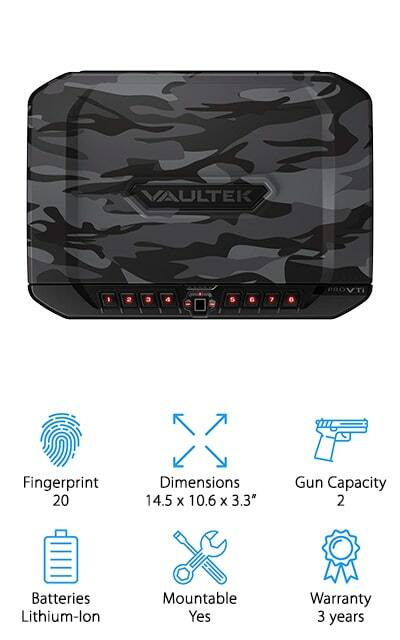 This may just be the best biometric gun safe we have found yet and there are plenty of great reasons for that. First, you’re going to be able to store up to 100 different fingerprints all at the same time, which is a great way to get everyone who needs access in. It’s also able to store up to 2 handguns so you always have a safe place to store your weapons. Made with cold rolled steel, this system is fully mountable to increase security and has a 5-year warranty so you know you’re getting quality. Add a 1.5V battery and you’re going to be ready to go. You’ll also have a way to keep your guns better protected because the inside of this case has a foam padded interior and a low battery warning system. There are even backup keys to make sure you can get in if there’s no battery power. This heavy-duty steel safe is one of our best rated biometric gun safe options. It’s high quality and makes sure no one is going to get in that isn’t in the system. 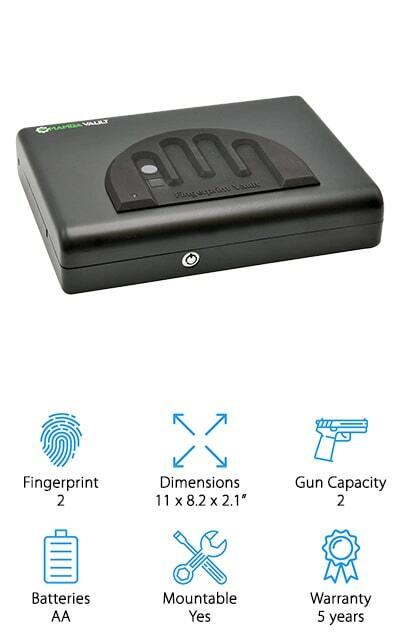 It holds up to 2 fingerprints at a time to make sure there are only a limited number of people with access to your safe and it has a quick process to run a scan. Completely unbreakable, this safe holds small pistols and handguns as well as ammo and documents or other important items. It’s completely portable as well, so you can always have access to your weapon when you need it. There are elastic straps to hold it more securely and a carry handle that can be added to make transport even simpler. All you need are AA batteries and it will be ready to go and you can even mount it to the wall if you want a more permanent and long-lasting option. Here you’re getting a box safe that’s actually considered a smart vault. 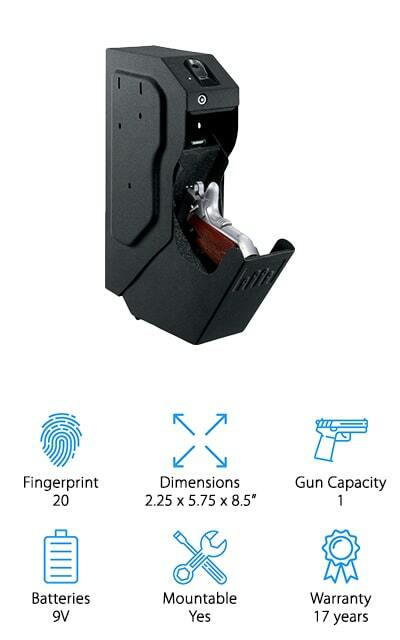 It has a biometric system that can hold up to 15 fingerprints at one time and the safe itself holds up to 3 guns. It’s also fully mountable so you can make sure that it’s securely fastened to a wall or inside a closet where no one is going to take it away. The moderate size makes it easy enough to store just about anywhere in your home and the auto open door makes it simple to get what you want out after you unlock it. Made by a company that is well known for residential safes throughout the country, this one is high quality and provides the right blend of storage and security while still keeping your gun hidden away. It’s even made in the USA so you know you’re getting something good. This moderately sized unit is actually able to hold up to 30 different fingerprints to make sure you can get access for anyone who needs it. It also uses a biometric sensor chip that holds over 25,000 different points on each fingerprint to make sure that it’s valid. Super easy to lock and to access, it runs off standard batteries that make it easier to get up and running in no time. You can even mount it to a wall or in a closet to make sure it’s even more secure. 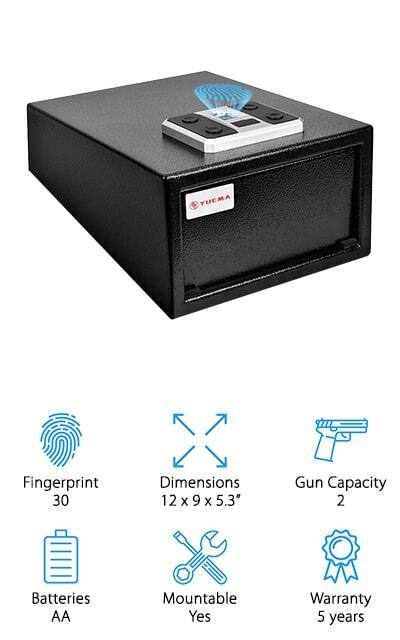 The 5-year warranty definitely lets you know that you’re getting something high quality and the fact that this safe is made with cold rolled steel plating means that it’s durable and ready for anything. You can even add a secondary authentication so that biometric screening and password must match in order to get access. 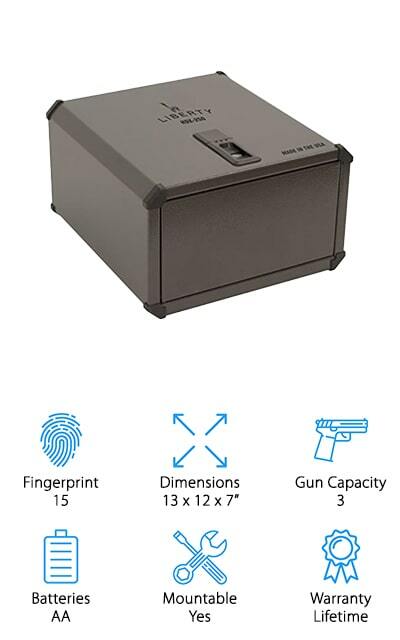 With this best small biometric gun safe, you’re getting enough space for 2 guns and a simple to use system that will give you the access you need. It’s able to store 20 fingerprints at the same time, so you can make sure anyone you want is able to get in but it also has plenty of safety features to make sure no one else is going to get in. The welded steel frame has a compression latch to make sure no one else can break in but you can get your gun out quickly and silently. It uses standard batteries to make sure it’s easy enough for you to keep running as well. You even have the ability to mount this safe and make it even more secure or turn on the alarm that automatically locks down the safe in case of any type of movement or tampering. No matter what you do you’re going to have a secure system to help you even more with security.